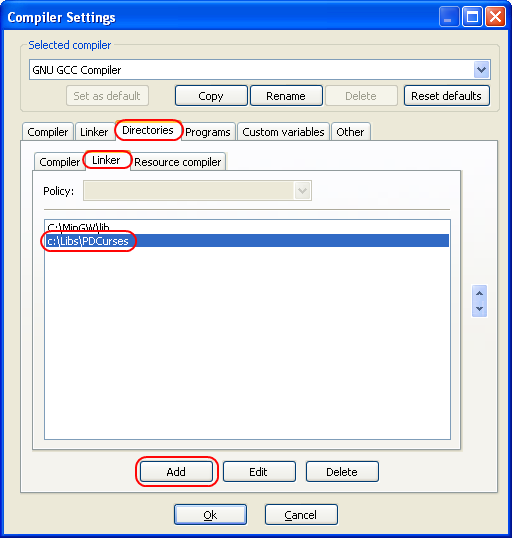 A) Go to the “Settings menu” and pick “Compiler”. B) Click the “Directories” tab. The compiler tab will already be selected for you. C) Press the “Add” button, and add the path to the .h files for the library. If you are running Linux and installed the library via a package manager, make sure /usr/include is listed here. D) Click the “Linker” tab. Press the “Add” button, and add the path to the .lib files for the library. If you are running Linux and installed the library via a package manager, make sure /usr/lib is listed here. E) Press the “OK” button. For step 5, we need to add the library files from the library to our project. We do this on an individual project basis. A) Right click on the bolded project name under the default workspace (probably “Console application”, unless you changed it). 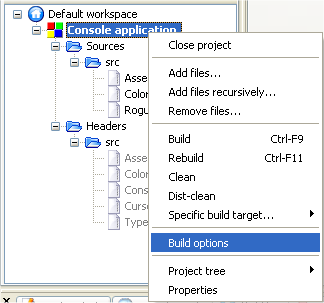 Choose “Build options” from the menu. B) Click the linker tab. Under the “Link libraries” window, press the “Add” button and add the library you wish your project to use. See the tutorial A.1 -- static and dynamic libraries for more information step 7. That was awesome!!! It solved the biggest problem I have met these days! i still have the same problems, it founds the header and comands, but it says there are like 40 undifined references. hi Alex, how can I use c++ for backend, and where can I learn about it ? As a backend for what? First, I can't seem to find the .lib files necessary for step 5 of this tutorial. string is different than cstring -- string contains the std::string class. Header cstring contains a bunch of functions inherited from C to work with C-style strings. "Did you download the Windows binaries rather than the source code?" I'm pretty sure that the stuff I downloaded was the source code: https://sourceforge.net/projects/id3lib/files/id3lib/3.8.3/ That's what I'm supposed to have, right? In the thing I just linked, I tried both zips, and neither of them seem to have the .lib file. That looks right. I see a .lib file inside the Debug and Release folders. still I am getting ‘undefined reference to’ errors.. please tell me how to solve it? Most likely the program is that the lib file isn't getting linked in. Do you see it get linked in? still I am getting 'undefined reference to' errors.. please tell me how to solve it? Did you #include the header files that contain the declarations you're using? I had to add an external library. Did you #include the appropriate header files in your code? Library files only supply the precompiled code; you still need the declarations to use it. Thanks for you the detailed information, however I would like to know how to download a library? I am not able to compile my code in Code Blocks because it says there no such file or directory. I know how to link the library with code blocks but I do not know how to download the library to link to with Code Blocks. Downloading a library will depend on which Operating System you are using. On Windows, you will need to download from a website, for example, to download PDCurses, go to http://sourceforge.net/projects/pdcurses/files/pdcurses/3.4/ and download pdc34dllw.zip which is a pre-compiled version of the library. On Linux, you can use the package manager to search and download the library. Hi, thanks a lot for all these useful information ! I don't understand why we need to say to the linker which library to use for our project (step 5). This is already defined with the #include lines in the source files, and in the step 3) and 4) we defined the paths for the compiler and the linker, so they know where to look for h and a (or lib) files. Header files and libraries may have different names, and there's no direct association between the two. When you #include a header file, the linker can't infer what library file contains the relevant definitions. You have to tell the linker explicitly. I like your C++ course, but some of the ads are a little raunchy. I don't think I can use this site for teaching high school boys unless you clean up the ads. Less traffic for you. Alex, thank you for the huge amount of work that you've been doing for us! It is very helpful, especially for people like me, the kitchen table learners :d.
Has anyone worked with PDF Creator Pilot library and Code::Blocks 13.12? and for some reason it is not working :(. When I include one of the *.h files, the CB gives errors like the following "error: 'DLLEXPORT' does not name a type". Is there anything else that I need to do (copy files from/to different locations) or some key lines that are missing from my main? Does the order of the steps count? Any suggestion is greatly appreciated! Thank you! Thank you very much. I learn to us Codes Block with boost libraries. through the wall that was confronting me. Now I know how to link my compiler to libraries... thanks to you. Your post is very useful! Hi, I need to add libnoise to Code::Blocks in order to work with perlin noise. I added the libraries of libnoise, and made a little test which compiles with no problems. But, whenever I try to build and run the project, it sends me a message which says: undefined reference to 'noise::module::perln::Perlin()', and five similar messages. In theory, this should be enough to build the project, but it's not. Please, somebody who have worked with libnoise or have an idea about what is wrong, please write a reply. I had to use / instead of a slash. Hey man, I just wanted to give you props for this - you saved me! Code::Blocks is truly fantastic, and I was hoping to get it working. This was an amazing tutorial. This was perfect to the problem I had earlier, and it helped me solve it! Your the best Alex thanks! fantastic languages, i mean, C C++ Java Perl Pascale etc..
like C# it is exactly like java with Capitalized methods. I am sorry but as far as microsoft is concerned to me he is just like a parasite.